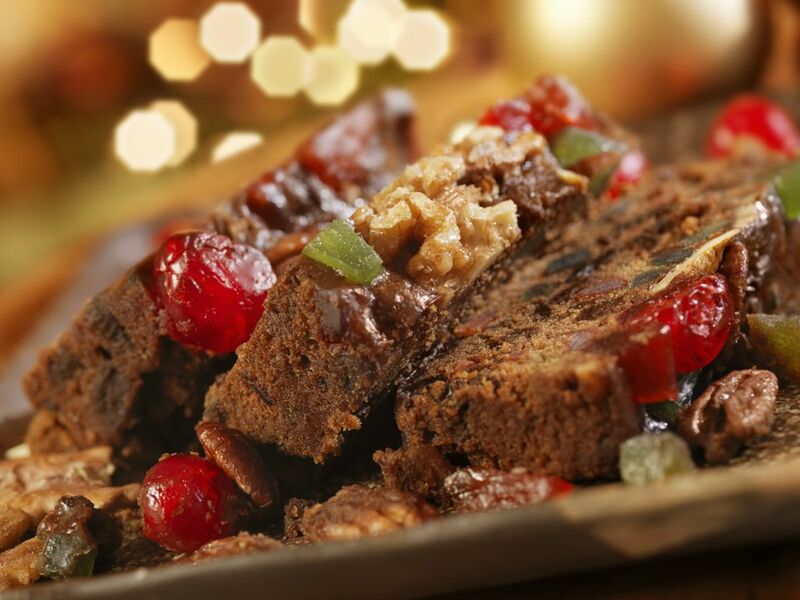 Fruitcake—a classic Christmastime baked good—is all about the fruit and spices. Brandy and orange juice add extra flavor, and you can adjust the amounts of fruit and add some chopped nuts if you like. This recipe makes two cakes, so you can give one away to a friend or loved one. Place the fruit in a large bowl with the orange juice and brandy. Stir gently and set aside for a few hours. Generously butter the bottom and sides of two 9 x 5 x 3-inch loaf pans and line them with parchment paper. Butter the paper thoroughly. You can use brown paper for this if you don't have parchment paper. Put the butter in a large mixing bowl and cream with a heavy-duty electric mixer until smooth. Add sugar; cream until light and fluffy. Beat the egg yolks slightly and then add them to the bowl. Mix the batter well. Stir the batter as you add the flour and spice mix, a little at a time, stirring well after each addition. When the dry ingredients are thoroughly incorporated, add the molasses and stir. Next, stir in the fruit, along with any soaking liquid left in the bowl. Put the egg whites in a stainless steel or glass bowl and beat with a clean beater to stiff peaks. Fold them into the batter thoroughly and then spoon the batter into the prepared pans. Cover pans loosely with a clean cloth and let the batter sit overnight in a cool place to mellow. The next day, heat the oven to 250 F. Place the uncovered pans on the middle rack of the oven and bake for a total of 3 1/2 to 4 hours. After 1 1/2 hours, cover the pans with a piece of brown paper (do not use foil) or set the pans in a paper bag and return them to the oven. When the cakes have baked for 3 1/2 hours, test them with a toothpick or cake tester. If the tester comes out of the center of the cakes clean, the cakes are done. Leave them in their pans and set on a wire rack to cool. When the cakes are completely cooled, turn out of the pans, leaving the paper lining on the cakes. Wrap the cakes with parchment, then foil, and pack them in a tin. Homemade fruitcakes need air, so punch a few holes in the lid of the tin or set the cover loosely on the tin. Set the tin in a cool, undisturbed place, and every three or four days before serving, open the foil and drizzle a small amount of brandy or bourbon over the cakes. The liquor will keep them moist and flavorful and help preserve them as well.